We meet once a month (except in June, July and August where we have no meetings). Our meetings are times where fellow members can share information about their ancestors, their current historical research, or some newly found Confederate heritage site (topics ranging from the recent discovery of the Confederate troopship, CSS Kentucky, "The Invasion of Camp Jackson", or a battlefield account by a St. Louis area Confederate soldier). Many of our members are re-enactors , that can share their experiences at modern living-history battle reenactments that are sometimes filmed for motion film productions ("Gettysburg", etc.). Meetings include a featured guest as well as in-house speakers (In the past we have had historians from the Missouri Historical Society, local historians, published authors, William C. Winter, writer of "The Civil War in St. Louis," or Gene Dressel, author of a book on St. Louis Confederates buried in Bellefontaine cemetery). Just west of I-270 off of Olive Blvd. For Google map directions, click here. 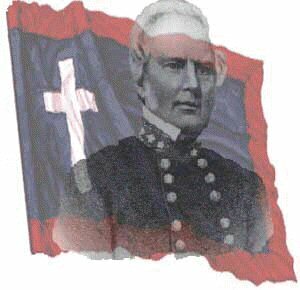 Note: The September 2019 meeting will be held at a special location in Pacific, Missouri, marking the anniversary of Gen. Sterling Price's birth. Click here for details. For questions regarding meeting times, please contact us.